You may have heard that companies are doing away with formal performance appraisals and formal rating systems, but the number doing so are quite small. The Society for Human Resource Management found that 91% of companies still conduct annual performance reviews, and for good reasons: employees need to know how they are doing and the company needs a formal record of their successes or failures. If you’re putting together a performance review, you may want to start with a template that can help you think about the fields you need. While the template can help you get started, you first need to ask yourself these questions to find the right performance review template for your organization. Do You Need a Performance Rating or Just Performance Feedback? Every employee needs feedback, but not every employee needs a rating. Performance ratings are best used when you have large groups of people doing similar jobs. For instance, if you have a sales force of 30 people, you may experience a time when you need to lay people off. If each salesperson is rated on a scale of 1 to 5, you will choose your lowest performers (the 1s and 2s) before you terminate your high performers (4s and 5s). This makes determining who to layoff easier and you can easily defend your decision in court. If most of your employees do different jobs, you may not want to give ratings. What is more important than ratings is feedback. Your employees need to understand where they succeeded, where they failed and what they need to do to move your organization forward. Is Goal Setting Individual or Group Based? Create a new on-boarding program. Deliver monthly turnover reports to the senior management team. Conduct a salary market audit, to ensure fair and accurate salaries. Another Human Resources Generalist might have completely different goals. Perhaps you have asked her to focus on training and development, employee relations, and employee communication. When employees have individual goals and performance expectations, your performance review template needs to provide the opportunity to give individual feedback. For other jobs, such as grocery store cashiers, you will base goals on specific standards—the number of items scanned per minute, for instance. Many positions have a mix of personal and group goals. For example, organizations pay sales team members for specific levels of sales. But, they also want each employee to care about the other sales peoples’ customers and work as a team to serve them. Sales teams need a mix of individual and group-based goals in their performance review template. You need to decide which type of performance review will best help your employees to succeed. While you may find it tempting to create a performance review that covers every aspect of an employee’s performance, remember that the performance review needs to be useful. An employee who has 30 different performance goals will feel overwhelmed. As a result, she may perform more poorly than if the manager had pulled out the top 10 goals for her to work on. 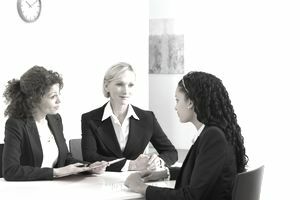 This allows the manager to provide focused follow up during the year that emphasizes her most significant deliverables. Are Values or Tasks Emphasized in Employee Performance Expectations? Some companies focus their performance reviews on the company values rather than hard numbers, such as sales or customer feedback. A values-based review focuses on whatever values the company has set, such as risk-taking, teamwork, and a customer-centric focus. Many performance review templates feature a mix of values and tasks, with goals in both areas. These are excellent sample performance review templates for a variety of different situations. Remember, performance review templates are just ideas about how to review employees’ performance. Use these sample performance review templates to help you develop a specific form for your business. Numerical performance review (scroll down to forms, and then click on Numerical Scale Form). This type of performance review works well when you have numerous similarly situated employees to evaluate. It can help you obtain an objective overall rating rather than just relying on a manager’s gut feeling. Overall performance review (not goal specific). This template allows managers to look at general work skills and performance, without detailing specific goals. While this template also includes a rating, it’s not as detailed as the ratings in the above performance review. Technician performance review. Ignore the social security number field on this template—no such document should ask for this number because of employee security and privacy issues. But, this is otherwise a helpful way to look at a goals based, technical review, in a blue collar job. Note how this performance review template is a mix of skills and company values. Knowing what your needs are from your employee review process will help you select the best possible performance review template to help you develop your employees and grow your business. Want Top Ways to Overhaul Your Onboarding Process Using Software?